Spies, Grapes & Giants…oh my! I could waste many hours, and even years, trying to decide if I should take my writing to the next level…or I could just take a shaky step of faith and see what God does. For many years I have been plagued by “I’m not good enough” and I’ve had enough of that; it is exhausting! There will always be better writers, singers and teachers than me, but I have something to offer, however small, and I am not hiding it under a bushel anymore. Is there something God is asking you to offer to those around you? It might be a talent, treasure or your time. I want to encourage you today, to take the next step. Ask the Holy Spirit to guide and provide as you dare to dream, and shine for His glory and fame. I have been bound by doubts, fears, and discouragement too long- have you too? Today is the day to let those chains go and live in the freedom found in Christ alone. You are made in His image and you are loved, so very loved. In Numbers 13:1 ”The Lord said to Moses, ‘Send some men to explore the land of Canaan, which I am giving to the Israelites…'” So Moses sends out twelve men to spy out the land. 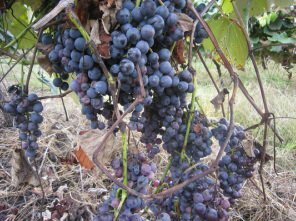 In verse 23-25 we read, “When they reached the Valley of Eshkol, they cut off a branch bearing a single cluster of grapes. Two of them carried it on a pole between them, along with some pomegranates and figs. That place was called the Valley of Eshkol because of the cluster of grapes the Israelites cut off there. At the end of forty days they returned from exploring the land.” They gave an account of what they had discovered. They showed the fruit of the land, and reported that indeed it flowed with milk and honey. BUT, then they pointed out the giants in the land, “the people who live there are powerful, and the cities are fortified and very large. We even saw descendants of Anak there” (verse 28). Despite the fruit of the land (that massive fruit that took two men to carry it), the giants loomed large. BUT, “…Caleb silenced the people before Moses and said, ‘We should go up and take possession of the land, for we can certainly do it.’ But the men who had gone up with him said, ‘We can’t attack those people; they are stronger than we are.’ And they spread among the Israelites a bad report about the land they had explored. They said, ‘The land we explored devours those living in it. All the people we saw there are of great size. We saw the Nephilim there (the descendants of Anak come from the Nephilim). We seemed like grasshoppers in our own eyes, and we looked the same to them’” (verses 30-33). They were distracted by the giants. They made the giants into something worse than they really were.They forgot who God was. The God who delivered them from the hand of Pharaoh. The God who promised them the land of Canaan. There may be obstacles in your way, or doubts and fears threatening to overshadow the fruit of your Canaan. But, remember His promises. Remember who God is. He is greater than the giants. He is able to produce fruit in an unknown land. Trust God as you take the next step. My guess is, as we follow His lead, He will surprise us and provide what we need as we enter the land that He has for us.